I’m a writer, a creative. And while it’s words I weave it’s also a very visual process – most writers will tell you the same. In our mind’s eye, we can see our characters manoeuvring through our created landscape, we envisage them interacting with each other and with their surrounds. Clear as day we see them walking down the street, being chased through the wilds by a monster, piloting a spaceship or riding a train. I can’t tell you the amount of times I’ve wanted my worlds brought to life, and while I love to draw, I don’t have anywhere near the talent of some of my contemporaries. Talent is a bit of an understatement, though, as you’ll soon see. In my last post, I spoke about Montgomery Borror’s, art, and how much of a damn fine artist he is. As his Kickstarter is so close to being realised, I’m going to show you why the man’s work needs to be out in the world. A few years ago, I wrote a steampunk horror short – Shovel-Man Joe – that won the Australian Shadows Award for short fiction. It was my first stab at steampunk, and I fell in love with the genre. The story is set on a train, but it’s a train like no other. I could see it clearly in all its sinister glory, but with a very limited word count I had to write tight. I’m not a poet, not by any stretch of the imagination, but I have a love of Coleridge and his words, so I took a chance to tell part of the backstory of the tale with… yep, you guessed it, a poem… of sorts. The poem is regaled by one destined to tell and retell the story of the train and those who choose to ride it (think Rhyme of the Ancient Mariner). It’s told within the workings of the story, and while penning it, I saw the train screaming down the tracks toward the exiled depot, and I hoped the poem would work well enough to pass that visual on to the reader. This was my introduction to Monty, the master-illustrator and it wouldn’t be long until we were working together on a comic based on one of my stories. 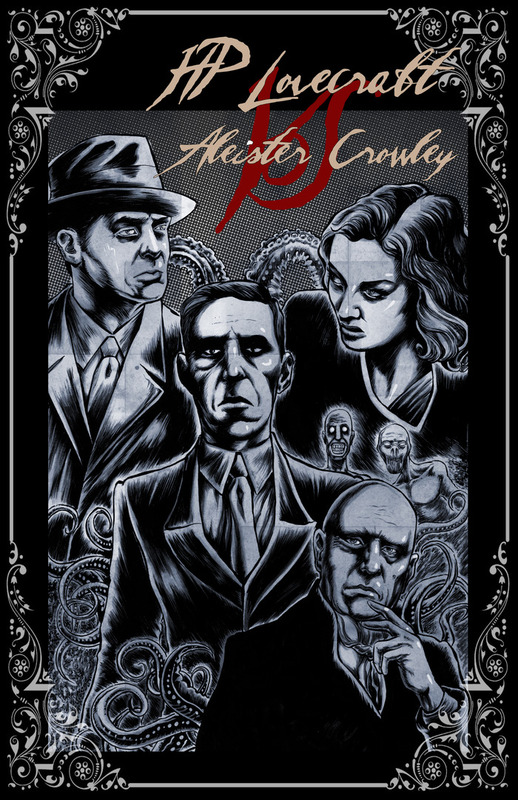 That project is a while away yet, and Monty being the workaholic he is, has another project on the go – one where he’s both writer and illustrator, and where he tackles two of the masters of horror: HP Lovecraft vs Aleister Crowley. With just five days to go and just $140 to get to fund the project, he’s so close to getting his dream comic off the ground. So, for those who are a little unsure as to whether they’d like to kick in, just take a look at Monty’s work, and trust me when I say you won’t find a harder-working, more dedicated illustrator. I now own a copy of ‘Train in Vain’, and though it was drawn for another’s story, take a look at it below and read the poem I’ve pulled from ‘Shovel-Man Joe’, and if you can, think of backing Monty so he can get his artwork out in the world. Crack! The whip struck Shovel-Man Joe! Back slashed red, blood and sweat flowed. Piled high at his feet were limbs and entrails. The shovel scraped loudly; the fire inhaled! 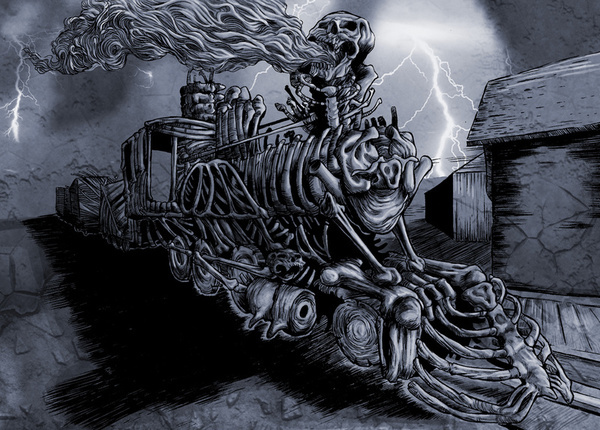 The engine chugged forward on pistons of bone. The whore settled back, spread wide with a sigh. Fresh meat, the fire roared! Ride the train it was writ; be the first to The Pit! But who has returned and spoken of it? He comes, can you hear? Who’s the first to disappear? Whispers in the halls; scratching in the walls. One by one you will surely fall. Beware the Shovel Man’s ire! Feed the fire! Feed the fire! You must all pay the fare.